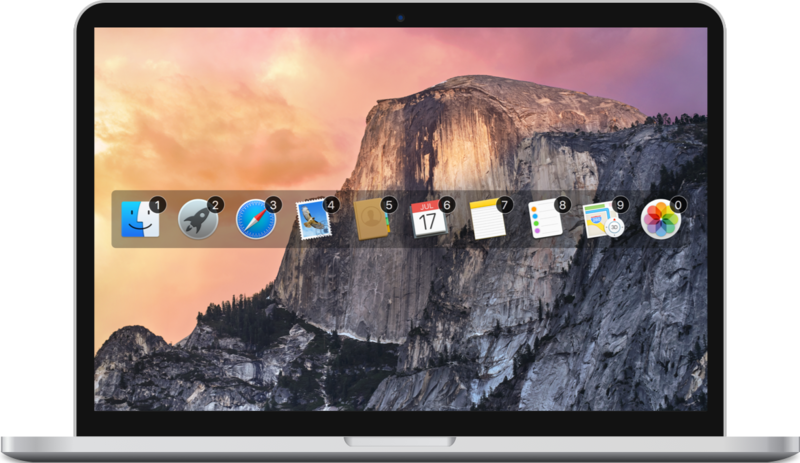 Manico is a fast app launch and switch tool designed for macOS. If you are a person who would like to use keyboard to make effective use of operating system, Manico will help you maximize your efficiency. Manico is a very easy to use app, you can learn how to use it without any configuration and study. Just remember, when you want to switch to an app, hold the Option key and press the target number, you will be switched to the target app immediately. If this app hasn't launched yet, Manico will also launch it. The idea of Manico comes from Ubuntu Unity desktop, if you've ever used Unity desktop and get used to the Super key feature, and want the same feature in macOS, then Manico is designed for you. This is also the initial goal why I developed Manico. In our daily computer life, we all have some app which will be used very frequently, like Finder, Safari (or other web browser) or Terminal. Switch and use them should be direct, the traditional way of CMD+Tab should only be used when switch to the not common used apps. The official purchase channel is now closed. Old users will not be affected. Please go to Mac App Store to purchase Manico with In-App Purchase. 0. Can I customize the apps? Yes, you're allowed to customize the apps whatever you want. 1. Can I customize the hot key? Absolutely! Manico uses the Option + Number combine key by default, but you are also allowed to set any other combine key. 2. Why sometimes Manico hot key doesn't work? Please check if your cursor is focus in the password input. Because of macOS's security mechanism, the option hot key will be disabled when password input field is focus. 3. How can I use the default Option feature? The original Option+Number combine key will output the characters like: ™, £. If you need to input these character, just double-click and hold Option key, now press other key, it will bring the original feature for you. Please leave your message here, Thank you! Special thanks to Unity desktop, it made me inspired the idea of Manico. Thanks to ghawkgu, ohsc, keke, kevinzhow, who helped me during the development of Manico. Copyright @ 2019 Tualatrix Chou. All Rights Reserved.